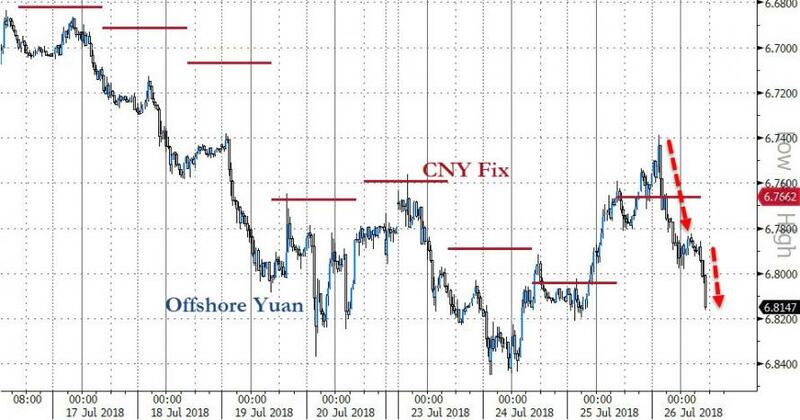 Yuan Tumbles As China Rages At Washington's "Extortion, Demonization"
The brief rebound in the Yuan is over as a barrage of headlines from China and US spark renewed concerns at Beijing's ability to withstand Washington's war. Rural voters voted disproportionately for President Trump in 2016 and most rural areas have Republican representatives in Congress. Retaliatory tariffs recently implemented by China are particularly focused on agricultural exports that would impose disproportionate economic losses in rural areas and could weaken support for the President’s trade agenda among these constituencies. Additional subsidies are likely to reduce this effect, though they will probably not reverse it entirely. Overall, developments over the last few days suggest that risks from trade policy are becoming more concentrated on the US-China trade relationship. The preliminary US-EU agreement could lead the White House to believe that imposing tariffs on imports from China could increase the probability of a US-China agreement. With subsidies in place to guard against some of the domestic economic fallout from retaliatory tariffs, the White House is likely to have additional political flexibility to pursue that strategy. 2. The failure of Chinese regulators to agree to the Qualcomm-NXP deal has prompted notable reactions with NXP CEO confirming his view that "the China decision was absolutely political," and prompting broad-based concerns that all China-related M&A is off the table for now. 3. Deputy U.S. Trade Representative Dennis Shea blasted China this morning as the “most protectionist” economy of all at a meeting of the World Trade Organization in Geneva. Shea said China has failed to introduce reforms to make its economy more open to market forces and the harm that is doing can “no longer tolerated," pointing out that China’s approach to international trade is a “zero-sum game." 4. China has officially threatened - despite its notably asymmetric trade position - to retaliate for any amount of US tariffs, prompting fears that it will use alternative methods of retaliation (i.e. devaluation). Additionally China's WTO Envoy snapped back at US that "extortion and demonization does no good" adding that "holding our feet to the fire won't work." This trade war is far from over.